Melbourne Madness shows are the perfect choice for Child Care Centres, Kindergartens, Pre-Schools and Schools and are designed to create an active interest through its themes post show. The Pre-School shows (children aged 3-5) are structured around ELYF (Early Years Learning Framework) whilst the Primary school shows (Prep to Grade 3) have direct links to AusVELS key learning areas. The shows are engaging and create a positive experience for everyone as all children will be involved whist they embark on an educational and laughter filled journey of music, magic, puppets and singing. We’re all going on a holiday! 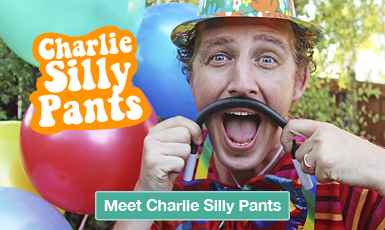 Charlie SillyPants is packing his bags to go on the best Holiday ever, do you know why? Because he’s going to find some new friends! The Children will help Charlie prepare then go on a holiday to Magicland as they meet funny characters and many new friends. Focusing on the themes of friendship, Charlie Sillypants might find out that what he was looking for may have been closer to home than he thought! Sport Boy loves to play games, but he’s got no one to play with! 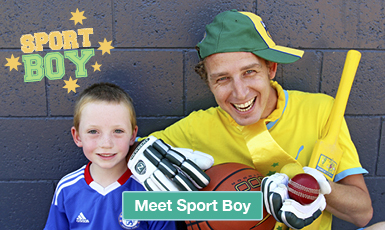 The Children will help Sport Boy unlock the key to Games world where they will work as a team to play as many games as they can. With lots of high energy fun, the children will help Sport Boy learn that playing games are not only fun but they can also keep you healthy. 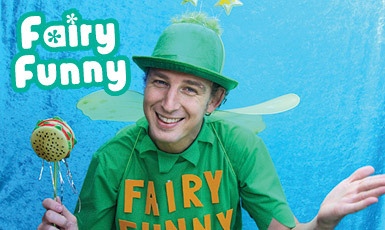 Fairy Funny is a magical fairy, but he’s also very cheeky. He likes to use his Magic book to try different spells, but he just seems to be getting them wrong! He’s going to need lots of magical helpers and a lot of imagination to help undo the magic spells he’s created. 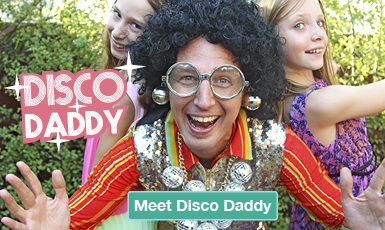 Disco Daddy is confused, he wants to play his favourite music but it just doesn’t sound right! The children will help take Disco Daddy on a very funny adventure to Music Mountain as they explore, different sounds, music, singing and dancing. There will be funny characters along the way using magic to trick him, so children must remember to bring their magic! It’s Christmas Eve and Charlie SillyPants can’t wait to get his presents, but there’s a problem! He sent his Christmas list to “Sandy Claws” at the “Fourth Hole”! We will need lots of Christmas cheer to get the list back to Santa in time and Charlie might still be able to perform “A Miracle on Fourth Hole Street” just in time for Christmas. Tailored shows written with funny and creative plots focusing on the following themes..
All Primary school shows (Prep to Grade 3) have direct links to AusVELS key learning areas. We want to ensure every child participates in our shows, so to ensure this happens our audiences are capped at maximum of 40. However multiple show discounts apply if you need to cater for more than 1 show. Our house was transformed into Discoland. Disco Daddy was amazing, all the kids from the toddlers to the older ones loved your show. The colours and the music were great and the kids didn’t move from your area once. Your high energy is infectious and all of our family would like to thankyou so much for the quality of your show.